KENNEDY SPACE CENTER, Fla. — The Thermal Protection System Facility, or “TPSF”, is one of the many centers that has had to redefine itself in the post-shuttle era. Fortunately, as NASA works to repurpose Kennedy Space Center and convert it into a multi-user spaceport, the buildings’ unique capabilities are continuing to serve the agency as it focuses on sending crews to asteroids, Mars, and other potential deep space destinations. Jacobs’ Martin Wilson has a wealth of experience when it comes to working with a variety of materials that were used on NASA’s fleet of shuttle orbiters (which last flew in June 2011), as well as those that may be used on new crew-rated spacecraft which are set to take to Florida’s hazy skies in the coming years. The purpose of these materials and systems simply cannot be overstated. They will shield the crews flying from as near as low-Earth orbit and as far as, potentially, Mars and beyond. During re-entry, the Space Shuttle could endure temperatures as high as 3,000 °F (1,650 °C). SpaceFlight Insider was provided with a glimpse of the pure Silica (SiO2) heritage shuttle material (LI-900) emerging from the oven. Although no longer used on spacecraft (higher-performing materials have taken its place), the Silica cubes serve to demonstrate the capabilities that these materials must endure during re-entry. 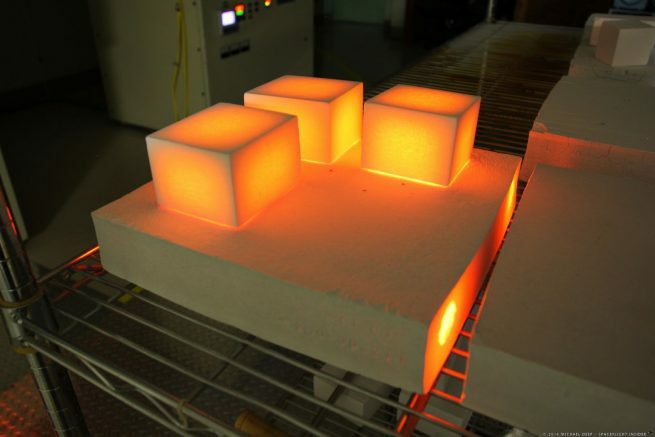 The Silica reveals shrinkage at approximately 2,200 °F (1,204 °C), albeit at a slow rate. SiO2 was certified to 2,250 °F (1,232 °C) for routine space shuttle mission re-entry profiles (2,500 °F / 1,371 °C for a single mission use). Wilson noted that after that temperature point, there was an array of metals, some of them exotic (such as René 41 and Waspaloy), that work well until about 1,200 °F (649 °C). However, in terms of re-entering Earth’s atmosphere, a spacecraft’s underbelly can see temperatures rise as high as 5,000 °F (2,760 °C). The Thermal Protection System Facility (TPSF) Annex is a building located on Kennedy Space Center (KSC) property. It is used to manufacture the advanced heat-resistant materials needed to protect vehicles such as the Space Shuttle and Sierra Nevada Corporation (SNC)’s Dream Chaser vehicle. Using additive manufacturing, or “3-D printing”, the TPSF has managed to utilize the relatively new technology to produce needed thermal components at a quicker pace – and reduced cost. 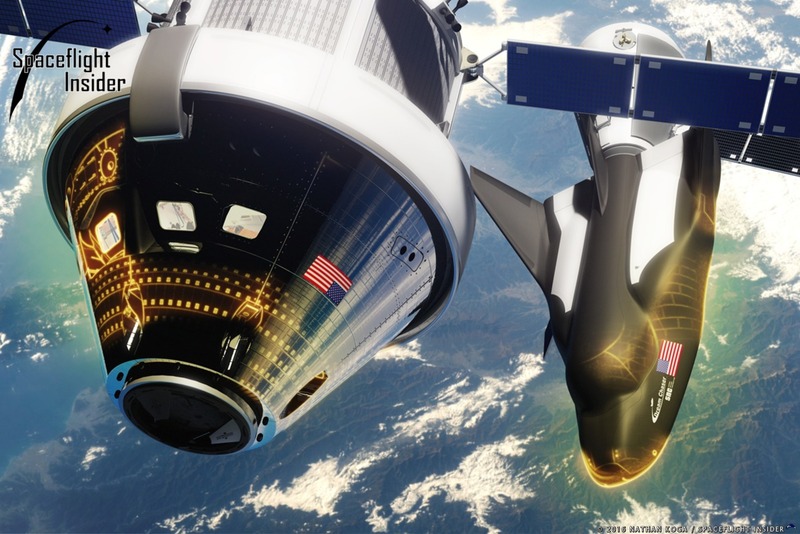 Sierra Nevada has worked with the TPSF from 2010 to the present, working out the details of its Dream Chaser thermal protection system under a Space Act Agreement and Commercial Space Launch Agreement. This work has continued despite SNC’s loss in the Commercial Crew Program competition. Wilson obtained a bachelor’s degree in Physical & Biological Sciences from the University of St Andrews, located in Fife, Scotland, in 1986, and a master’s degree in Materials Science & Engineering from the University of Florida three years later. 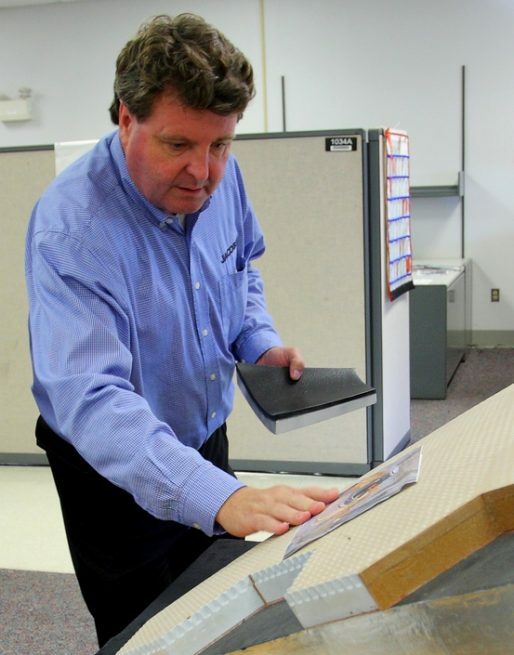 About a year later, in 1990, Wilson was working for Rockwell International as a TPS systems engineer. He would remain with the company until 1994. Wilson now serves as the TPSF’s manager, a role he’s held since 1998 (the facility was operated by United Space Alliance at that time). Indeed, according to Wilson, at one time, there were as many as three active facilities that were producing TPS components for the Space Shuttle. Now, however, with NASA Kennedy concentrating on converting the historic launch site’s structures toward making it a “multi-user spaceport”, the TPSF is no longer focused on a single vehicle as it was during the shuttle era. Instead, the facility is adapting to be capable of supporting an array of spacecraft, including Lockheed Martin’s capsule-based Orion as well as Sierra Nevada Corporation’s Dream Chaser cargo space plane. This presents the TPSF with a challenge, as these vehicles have radically different designs. Capable of supporting a crew of up to six, Orion is the spacecraft that NASA has selected to get crews out of and back into low-Earth orbit (LEO). It stands some 11 feet (3.3 meters) in height and has a diameter of 16 feet (5 meters). With a habitable volume of some 316 cu feet (8.95 m3 ), the second flight of an Orion spacecraft will use a Service Module supplied by the European Space Agency (ESA). Known as Exploration Mission 1 (EM-1), this test flight is currently scheduled to launch late in 2018 from Kennedy Space Center’s Launch Complex 39B located in Florida. Dream Chaser will measure some 30 feet (9 meters) in length when it is launched. This makes it roughly one-fourth the length of one of NASA’s shuttle orbiters. Also, the cargo version of the lifting-body design is intended to be automated. According to SNC’s website, the Dream Chaser Cargo System should be able to ferry up to 12,125 lbs (5,500 kg) of pressurized and unpressurized cargo, crew supplies, and experiments to the International Space Station. It should also be able to provide boosts to the station’s orbit and return pressurized cargo with virtually no wait time for scientists. “Comparing the Dream Chaser [to NASA’s shuttle orbiters], from a thermal standpoint, is kind of like comparing a boat to a Jet Ski: it’s smaller, a little denser, so its re-entry is going to be a lot faster – and a lot hotter,” Wilson told SpaceFlight Insider. 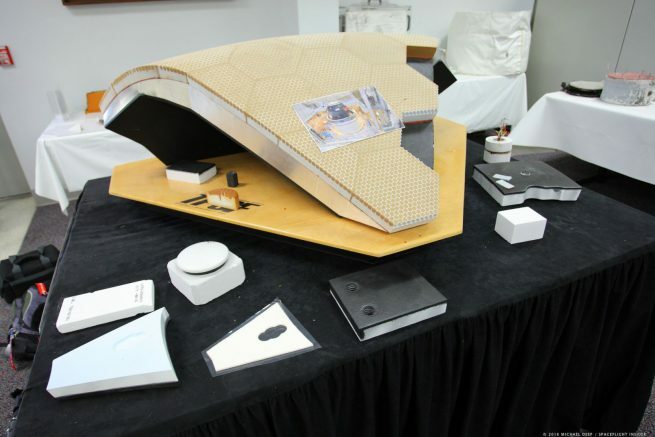 Dream Chaser would have a disposable cargo module and solar arrays as well as folding wings (so that it can fit within the payload fairings of existing launch vehicles). All of this makes developing a TPS for Dream Chaser much different than the one that will be used on Orion. There are other companies who are involved with NASA’s Commercial Crew Program as well as the space agency’s Commercial Resupply Services contract as well. While Orion would be launched atop the Space Launch System from Kennedy Space Center’s Launch Complex 39B, the other spacecraft would be sent to orbit from Cape Canaveral Air Force Station’s Space Launch Complexes 40 and 41. “I think you’d be hard-pressed to find a much broader array of skills, capabilities, and knowledge that exists right in the TPSF,” Wilson said.